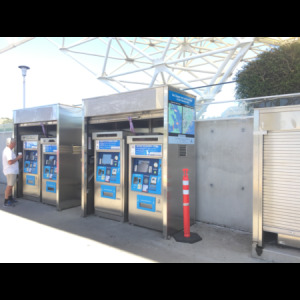 Built of welded stainless steel Little Buildings Ticket Vending Machine Enclosures (TVME) were just the ticket for this San Francisco Ferry company. Available in almost any size they have the ability to lock up your TVM at night via a roll-down stainless steel security shutter. TVME&apos;s were located in different locations to give patrons easy accessibility. Little Buildings Ticket Vending Machine shelters are available in a variety of sizes depending on the size and quantity of machines you want to protect. Available in less expensive galvanized steel or for corrosive environments such as along the seacoast, stainless steel. These particular TVM enclosures are 3&apos;x8&apos;. Contact Little Buildings Inc and see how we can help secure your TVM with a Ticket Vending Machine shelter!